Beautifully engraved certificate from the Mt. 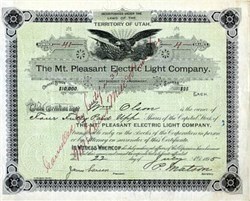 Pleasant Electric Light Company in 1895. This historic document was printed by Pyramid print and has an ornate border around it with a vignette of an eagle on a draped U.S. flag. This item has the signatures of the Company’s President ( James Larsen ) and Secretary (P. Matson ) and is over 105 years old. After taking lumber out of Pleasant Creek Canyon in late 1851, a band of Mormon colonists from Manti led by Madison D. Hambleton returned in the spring of 1852 to establish the Hambleton Settlement near the present site of Mt. Pleasant. During the Walkara (Walker) Indian War, the small group of settlers relocated to Spring Town (Spring City) and later to Manti for protection. The old settlement was burned down by local Native Americans, so when a large colonizing party from Ephraim and Manti returned to the area in 1859, a new, permanent townsite was laid out in its present location--one hundred miles south of Salt Lake City and twenty-two miles northeast of Manti. Among the founding settlers were Mormon converts from Scandinavia, the British Isles, and the eastern United States. By 1880, at which time Mt. Pleasant was the county's largest city, with a population of 2,000, more than 72 percent of its married adults were foreign born. This ethnic diversity had an important impact on village life during the nineteenth and early twentieth centuries. For decades, five languages were commonly spoken in town, creating confusing and sometimes amusing communication problems. The settlement and development of Mt. Pleasant followed the typical pattern for Mormon towns of the period. A square-shaped townsite was surveyed (eventually containing about 100 city blocks), lots were drawn, and the land was distributed among the population. Under the direction of James Ivie, a fort of adobe walls and log cabins was built. Pleasant Creek ran through the fort and farming was done outside of its walls. By the time the final peace treaty with the Indians was signed in Bishop Seely's house on Main Street in 1872, bringing to an end the Black Hawk War, many settlers had already erected homesteads outside of the fort. Although the townsite is large in scale, the density is relatively low due to the original layout allowing for only four lots per block. Mormon influence was felt in all religious, political, economic, educational, and social aspects of life in early Mt. Pleasant. Self-sufficiency was a virtue and home-grown and home-manufactured food, clothing, and furnishings were far more available than rarely found imported items. Some of the first industries included tanning, shoemaking, blacksmithing, basketmaking, and freighting. Eventual modernization brought such improvements as the Deseret Telegraph in 1869, the Pyramid newspaper in 1890--still the county's largest--and a telephone system in 1891. Sawmills and flour mills were built, irrigation systems were dug, and a municipal government was created to oversee public laws and improvements. The city was incorporated in 1868, a year after the first co-operative store was founded, starting what became a burgeoning commercial district. Upon the arrival of the Rio Grande Western Railroad in 1890, both the local population and the city's prosperity increased dramatically. By 1900 Mt. Pleasant had grown to nearly 3,000 persons, the largest size reached by any city in Sanpete County to that time, and the city had earned one of its nicknames, "Hub City." The town's newfound wealth became immediately apparent in a building boom which saw the replacement of small, wood-frame commercial buildings with much more impressive, architect-designed stone and brick structures such as the 1888 Sanpete County Co-op, the Gentile store which competed with the ZCMI, or Mormon, store. The resulting Main Street district is today so architecturally distinctive that the two-block-long area has been listed on the National Register of Historic Places. Equally striking were the Victorian churches, schools, and residences which replaced the simpler adobe and log buildings of the pioneer period. Mt. Pleasant has long been considered the most diverse city in the county, in part because of the liberal Mormons and the Protestant groups which challenged the dominant Mormon population in the late nineteenth century. Liberal Hall, built on Main Street in 1875, and Wasatch Academy, Utah's oldest private boarding school, established by Presbyterians in the same year, remain as visible and functional testaments of the city's historic and ongoing diversity. Mt. Pleasant has been culturally diverse as well, with numerous musical, theatrical, and artistic groups, varied local industries, secret societies and saloons, and one of Utah's largest local historic societies, founded in 1909 and still active. The twentieth century brought continued changes and improvements to the face of the "Queen City," its most popular nickname. The commercial and residential districts continued to fill with fine buildings bespeaking the prosperity of the community. By 1912 the first high school--North Sanpete--had been completed. The year 1912 also brought the Armory Hall, while the Elite Theater was constructed as a "fireproof" building in 1913. It burned down seven decades later. In 1917 a fine Carnegie Library was built in a modern architectural style. The Marie Hotel was erected in 1920 and a large cheese factory came on the scene in 1930, the same year that bus service came to town. The completion of U. S. Highway 89 in 1936 was a boon needed to soften the impact of Great Depression. A city hall in 1939 and hospital in 1945, together with new schools and churches, gave Mt. Pleasant a full complement of public buildings. Growth has increased in recent decades, as is evidenced by the small new shopping center on the south edge of town. The northernmost of the county's "big three" cities, Mt. Pleasant was well situated near forested mountains, vast, fertile fields, and a good supply of water. While several commercial and small industrial enterprises have flourished in or near the city since the nineteenth century, agriculture and stock raising have always been the area's economic staples. Currently, nearly half of all the farms and ranches are involved in wool growing, while thirty percent raise cattle. Dairy farming, turkeys, grain, and hay are other significant contributors to the local economy. Rambouillet sheep and shorthorn cattle were prominent at the turn of the century, while modern livestock breeds and food strains dominate today. In the 1990s Mt. Pleasant remains a thriving, steadily growing city. New buildings exist side by side with many remaining historic structures such as the library, Liberal Hall, Sanpete County Co-op, Jensen, Rasmussen, and Seely homes, and the campus of Wasatch Academy. In addition, the commercial district has recently undergone a sensitive facelift. History from the Utah History Encyclopedia.